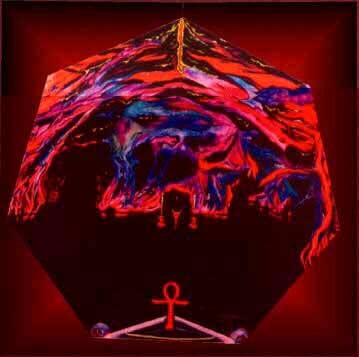 "Thee Temple Ov Babalon II"
43in x 43in, o/c, 1990, Private Collection. This painting was first constructed via astral workings with Nema and my fearless magickal partner, Fred Fowler, wherein the three of us together built a subterranean temple for observance of the mysterious rites of the Shakti, Babalon. This painting represents my second version of this liminal sacred space.